ST. OLYMPIAS, the glory of the widows in the Eastern Church, was of a noble and wealthy family. Left an orphan at a tender age, she was brought up by Theodosia, sister of St. Amphilochius, a virtuous and prudent woman. Olympias insensibly reflected the virtues of this estimable woman. She married quite young, but her husband dying within twenty days of their wedding, she modestly declined any further offer for her hand, and resolved to consecrate her life to prayer and other good works, and to devote her fortune to the poor. 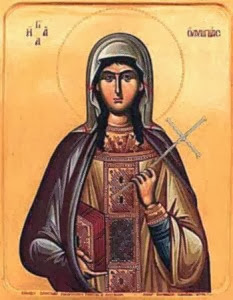 Nectarius, Archbishop of Constantinople, had a high esteem for the saintly widow, and made her a deaconess of his church, the duties of which were to prepare the altar linen and to attend to other matters of that sort. St. Chrysostom, who succeeded Nectarius, had no less respect than his predecessor for Olympias, but refused to attend to the distribution of her alms. Our Saint was one of the last to leave St. Chrysostom when he went into banishment on the 20th of June, 404. After his departure she suffered great persecution, and crowned a virtuous life by a saintly death, about the year 410. Reflection.--"Lay not up to yourselves treasures on earth, but in heaven, where neither rust nor moth doth consume."